NeuromonitoringUK.org – Promoting excellence in Neurological Monitoring throughout the UK. A warm welcome to our Neuromonitoring web page! Please have a look around, we are here to promote excellence in neurological monitoring in the UK through the sharing of knowledge and best practice. To find out a little bit more about us have a look at our about us page. To see what meetings and projects we have in the pipeline, check out our forthcoming events page. 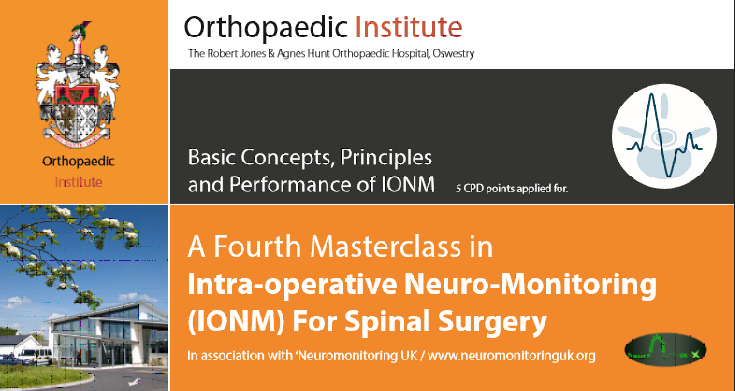 Anyone with an interest in Neurological monitoring can join our group you do not have to be an IOM (intraoperative monitoring) professional. The multidisciplinary team involved with surgical techniques involving neurological monitoring is vast, we would encourage anyone from surgeons, anaesthetists, ODPs, radiologists, physiotherapists etc who are interested in learning more about neurological monitoring to join our subscribership. Not only can the multidisciplinary team learn more about us and what we do but we can learn from you to promote seamless care for our patients.